The Jedi Order is the ancient peacekeeping organization of those sensitive to the Force, mainly the light side, dedicated to protecting the Galactic Republic. Its philosophies and objectives are considered the direct opposite to that of the Sith Order. Shirt: Green in color and should match pants. Should be fit, but loose, in arms. Must include bib, cuffs, and a stand-up tab-collar. Vest: Pale tan in color and should match stole. Sleeveless. Overlaps in the front above the sash and extends approximately 1” below the crotch. Stole: Pale tan in color and should match vest. Falls to edge of vest. Gloves: Plain brown, wrist-length, leather (or leather-like) gloves are worn. Pants: Green in color and should match shirt. No visible pleats or pockets. Sash: Natural in color and no wider than twice the width of the belt. Worn under belt. Should close in middle of back. Belt: Brown leather (or leather-like) belt with octagon metallic-looking buckle, attached Luke-style lightsaber hook, and d-ring. Boots: Brown leather (or leather-like boots) with no visible laces. Boots may zip up inside of the leg. Shaft should extend at least to mid-calf but below the knee. Lightsaber: (No toy sabers, no movie hero sabers, no Ultimate FX short saber). The lightsaber may be a static prop (hilt-only). Metal hilt lightsabers are preferred, though custom lightsabers constructed of other materials are permitted. Attached blade(s), LED lights, and sound effects, are allowed but not required. Blade colors accepted are: blue, green, yellow, orange, white and violet. No red, pink, or black blades. Double-blade sabers are allowed. Sash Attachment: Lightsaber hook and d-ring attach to the belt through the sash. Belt Adornments: Circle indentation to left of buckle and two silver snaps to right of buckle. Belt Buckle: Belt Buckle has a notch cut in the left side of the buckle. Belt Pouch Adornment: Belt Pouch includes a folded leather greeblie attached inside the pouch matching the reference pictures. Boot Gaiters: Boots have a separate gaiter located over them to give them the appropriate height. Saber Attachment: If lightsaber is worn on the belt, it attaches behind the saber clip and D-Ring. 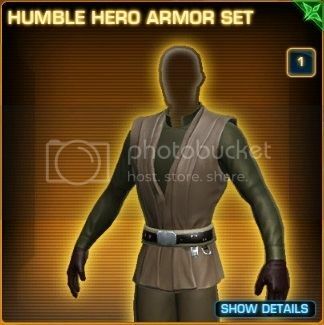 With the inclusion of the Relnex-style Jedi Robes from Star Wars: The Old Republic last year, I would like to submit the Humble Hero costume set for Rebel Legion approval. It is a full set costume purchased from the Cartel Market, as opposed to the Relnex costume which is comprised of several similar costume designs that share the same over-all look. The Cartel Market is part of the P2P, or Pay-to-Play, service that requires the purchase of special in-game currency using micro-transactions. The entirety of the costume that I am submitting is the unmodified version of the items from the Humble Hero Armor Set. 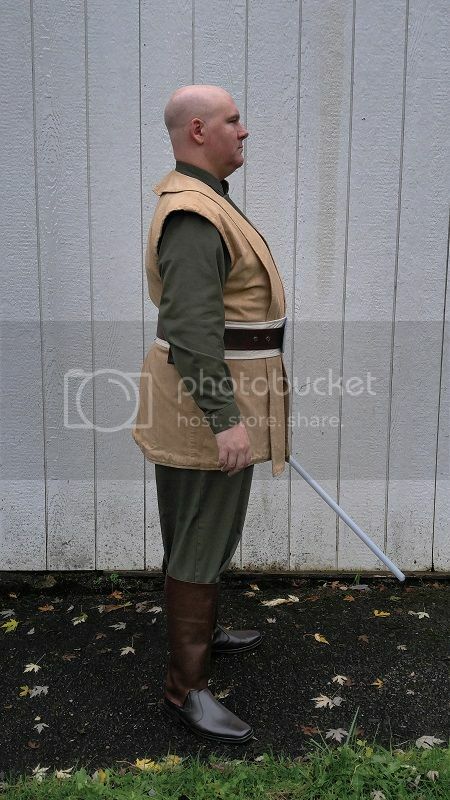 The costume itself is designed and based off of the Return of the Jedi Luke Skywalker costume ensemble. It includes a recolored and slightly modified variant of all the pieces in the Jabba’s Palace scene with the addition of a second glove and a belt similar to that in the Death Star Duel scene. It includes a shirt, vest, stole, belt/sash (explained below), trousers, boots, and gloves. My plan is to recreate this costume as perfectly as possible in real life. I will also include a prospective costume standard to assist the LMO with the standard creation. In addition to this, I will be using this thread as a WIP for the building of this full costume. The shirt is a long-sleeve shirt that is green in color. It is designed in a tab-collar or clergy-style and includes a full bib front. There is also a cuff added to the end of the sleeve, but no visible buttons on the cuff. The underside of the arm includes a seam that extends from the armpit to the cuff. The sleeves are fit, but loose, around the arms and the bib is stiffened and not wrinkled. The vest is designed in a short kimono style that crosses above the sash. It is tan in color and sleeveless, with the arm holes being a normal size for a suit jacket sleeve. It is thicker than the edges of the shirt which suggests a self-lined piece. It extends down to cover the crotch by approximate 1 inch in the front and crotch level in the rear. It is a simple jacket design with seams up the sides and across the tops of the shoulders. The stole is the same color/material as the vest. 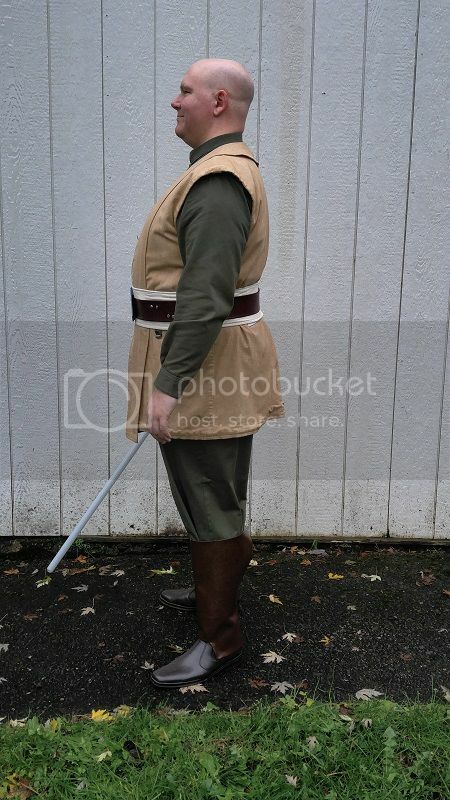 The ends extend slightly above the bottom of the outer tunic. They are the same width as the sash (approximately 4½” wide in the case of this body type). As with the vest, the thickness of the material suggests it is self-lined. The trousers are made in a scrub design with no pockets or fly in the same color/material as the shirt. They are fit, but loose, on the legs in much the same way as the sleeves of the shirt. The only seamlines are on the outside of the leg and the inseam, making it a 2-piece pattern. The belt is the most customized design of the entire costume. It includes the belt, pouch, sash, and lightsaber clips. The belt is brown leather and has a silver weathered and dented octagonal buckle. Measuring the male character height as approximately 6’3” tall (large male body type when compared to the normal male body type at 6’), the belt comes out to be 2½ inches wide (the female belt is 2 inches wide, as will be discussed below). The belt has a pair of ¾ inch silver snaps located to the right of the buckle (wearer’s right) and a 1 inch depressed circle to the left of the buckle. There is a single pouch behind the right hip. It is a rectangular box pouch that measures 1×3¾×7½ inches with a 1¾ inch flap secured by a silver snap. The belt includes a Luke-style silver lightsaber clip to the left of the buckle, held on by a pair of ½ inch wide rivets/screws. Beside the lightsaber clip is a 1 inch wide d-ring held on by a 1 inch leather strap which is secured to the belt by a pair of horizontally placed ¼ inch rivets/screws. The hook rivets are on the upper quarter of the belt while the strap rivets are secured to the lower quarter of the belt. Both items are attached UNDER the sash. The sash is 4½ inches wide and is natural-colored, in contrast with the outer tunic and tabards. 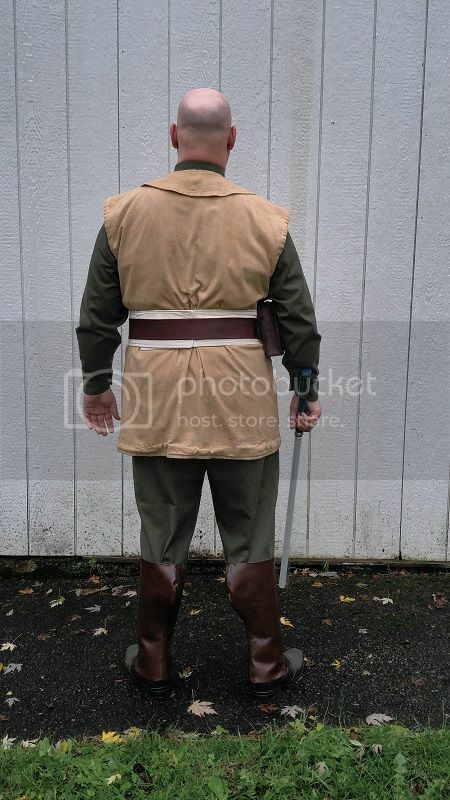 Because of the way the saber clip and d-ring fall under the sash, it is connected to the belt in at least that one area. This is not an animation error, as other belts with both saber clips and d-rings are over their respective sash. The gloves are brown leather wrist-length gloves that are unadorned. As with standard generic Jedi rules, the lightsaber must fall into the Rebel Legion standards. There is a difference in the heights of the characters that change the size of the costume between the shorter and taller body-types. For this, I am using only the standard male height and the big male height. Additionally, the fat male body has vastly exaggerated proportions and is not even worth looking at. The biggest difference between the male and female versions of this costume, beyond the height difference, is that the female variant of this costume has an exaggerated skirt on the pattern. This is probably due to the fact that the female body types have hips and a waist. It can best be accomplished with a simple addition of a more defined curve to the bottom (waist down) of the Vest. Otherwise, the female bodies use the same measurements for the various pieces as the males do, although the large female height is equal to the Normal male height. The female heights are generally the same as the male heights, particularly with regards to this costume’s measurements. The gloves are a part of the in-game set, so should be required. They match the color of the boots. 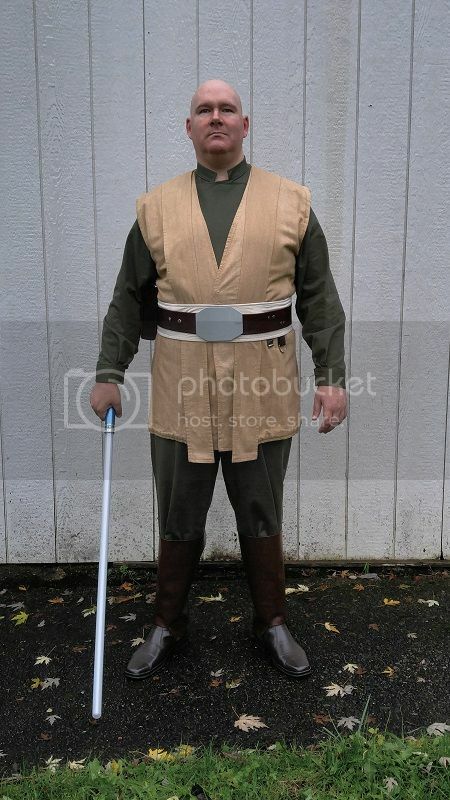 The costume is based on the look ROTJ costume with the colors changed. Those aren't the pictures I was approved in. I was approved with gloves and there are gloves in the standard. Don't be too touchy. I am commenting on a standard proposal not your specific costume. You did a nice job on yours and I commented in your build thread about not forgetting the gloves. Gloves: Brown, wrist-length, leather (or leather-like) gloves are worn.